Abbeydale Tennis Club is Sheffield's first and only All-Inclusive fee Tennis Club, offering members the opportunity to play free of charge at all times on both the four indoor and four outdoor courts - plus many other exciting benefits including free group coaching, free social tennis nights and free Cardio tennis classes. The Tennis Club has been in existence for 127 years and one of the reasons for that is that we listen to our members! 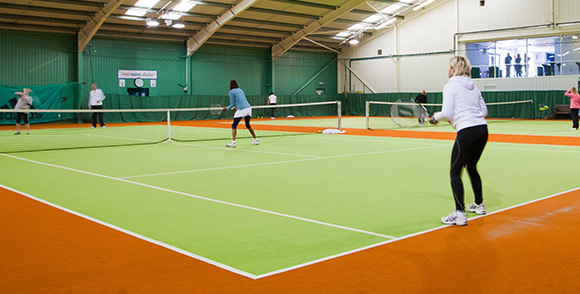 When we received feedback from one of our members surveys, the overall majority of members said they preferred one monthly payment rather than an annual membership subscription and then paying high indoor court fees throughout the winter on top of that. We have listened to our members and out of that 'A Whole New Ball Game' was born, offering members the opportunity to play unlimited tennis both indoors or outdoors 364 days of the year for one monthly fee. This policy enables all members the opportunity to play as much tennis as they like without the financial restrictions that have so often given tennis the unwelcome elitist tag. Tennis at Abbeydale is now truly available for everyone. As well as the free courts at all times, members receive a host of exciting extra benefits included with their membership package which are covered in detail on both the Adult and Junior pages.